I would like to state upfront that this is not an article on how to hand-feed. The information contained within this article is meant to acquaint a person with the numerous choices, considerations, and potential problems that can occur. Bookmark this article for future reference and as supplemental reading material. I’ve tried to cover topics that may not be fully covered or explained in most currently available information. The decision to hand-feed should be a personal choice, and not made because others say that this is the only way to guarantee a sweet hand tamed baby. I have also learned that in some countries that it’s preferable to handle the babies in the nest and have the parents wean them out. This is sometimes called Co-Parenting. Research, and ask other experienced breeders for advice, or to be your mentor. There is also a wealth of information on the internet, and internet forums. When researching, make it a point to find information that is Species Specific. What this means is any information that is specifically related to the species/type of baby you will be hand-feeding. Formula temperatures, quantities and frequencies fed do vary for different species of hand-feeding babies. If you decide to hand-feed you will be faced with many choices. Such as: What age to remove (pull) the babies from the nest/parents? How do I keep them warm? What do I feed them and how often?... just for starters. Refer to your chosen source of information for the basic hand-feeding requirements and suggestions for the species you are hand-feeding. Before you even contemplate what feeding utensil to use you will need to have some hand-feeding formula on hand. When new and asking you may find there is much controversy and disagreement about which hand-feeding formula is superior over another. You can research the internet or ask other breeders on forums for recommendations. Answers will vary, so bear in mind that although one hand-feeding formula may work well for one breeder or one baby, it may not work for the next. Read all available information and try to make an informed decision. When in doubt, do not hesitate to ask for additional information. Aspiration, Asphyxiation: Forcing formula into the baby’s mouth to fast resulting in the baby aspirating the formula. If the baby is unable to clear its trachea to breath it will asphyxiate and die. Yeast and/or Bacterial Infections: Can also be a secondary problem resulting from an overstretched crop. Burnt or Scalded Crop: Using formula that is not at the proper temp. Avoid heating the formula in a microwave oven. If this happens, food put into the crop will leak out of the puncture. The only way to correct this problem is to suture the inner and outer layers of the crop and skin. Antibiotics must be administered to prevent infection. If left uncorrected, infection will set in, and the baby will starve to death because the crop will no longer hold food. Malformed Beaks: Check the inside of the babies mouths when they are pulled to make sure that there is no buildup of food around the sides of the beak or under the tongue. The inside of the mouth should be healthy and pink. Babies beaks are still soft. The pressure of pressing the syringes into their beaks can create malformation in the beak. The two most common beak are scissor's beak and mandibular prognathism. Scissor beak is a lateral deviation of either upper or lower beak, while mandibular prognathism is a condition where the upper beak incorrectly fits inside the lower beak. If these deviations are caught early enough they can be corrected. 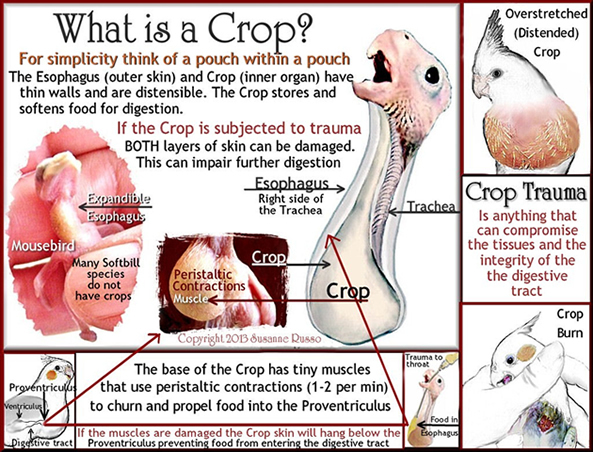 IMPORTANT, Before you Begin… Become familiar with the anatomy of the mouth, throat and crop of the bird. Feel free to print out the illustration to have on hand as reference until you are totally skilled and familiar with the use of your chosen feeding utensil. What do I use to Hand-Feed? The next decision will be what tool/utensil to use. The wide variety of utensils available can be overwhelming. For example a syringe is available in various sizes, and different style tips, and plunger styles. The units of measure scribed on the barrel can vary between different manufacturers. Some will be measured in ml or cc. BOTH are the same units of measure. If a syringe is scribed 5ml, this would be the same as a 5cc syringe. The important thing is to select and decide upon a hand-feeding utensil and method that you are experienced or most comfortable with, and appropriate to the size and species of chicks you will be hand-feeding. The purpose of this article is to acquaint you with the various types of Syringes, or feeding tools, also known a utensil, and methods used for hand-feeding. You are not limited to one method or utensil. If needed learn and have on hand alternate choice of utensil or method/technique. Over time most hand-feeders will develop a preference for a certain type of utensil for hand-feeding. It is still good to know how to use other methods of feeding and the proper use of feeding utensils. For example: Even though your preferred choice is feeding with a syringe, there might be a situation where you may have to force feed a baby or an adult to get nutrients into it. Thus, the need to learn how to properly use a steel crop tube/needle or a catheter is to your advantage when a bird is unable or not eating, or needs to be medicated. Another good source for opinions is other experienced breeders and hand-feeders. You should ask what utensil they use and why, as well as what age baby they feed with this utensil. I’d also be pointing out some of the pros and cons of each. EACH type of utensil can be safe if properly used, but if misused can result in serious injury and/or an untimely death. Whatever utensil you decide to use, always clean it thoroughly with hot, soapy water, followed by a good rinse. I prefer to allow my feeding utensils to air dry. Spoon Feeding was the original method for hand-feeding. A spoon is bent and shaped to fit the chick's beak. The idea was to simulate the parent's beak. It is a very old and safe way to hand-feed. Spoon Feeding closely resembles how the baby is fed by the parents. This method may not be an appropriate choice for feeding a day old baby, but it will work well on a two week old chick. The chick can eat at its own individual pace. The spoon is held in almost a horizontal position for feeding. The spoon should be as warm as the formula, so dunking it into a glass/bowl of warm water for a few seconds will warm up the spoon. The disadvantage of spoon feeding is that the formula chills quickly. A spoon feeding unit can be made or purchased, and is a combination of a syringe with a spoon attached to the tip. Pros: You will be able to avoid beak deviations, such as scissors beak, because there is no pressure on the sides of the soft baby beak. This method allows a better view of the mouth to be sure that the baby is properly swallowing the formula. Since it is a slower feeding method, flooding the mouth can be avoided, reducing the risks of aspiration. Cons: Messy, takes more time, and difficult to measure the bird's actual intake of formula. Weigh the baby before it is fed, feed, and subtract the pre-feeding weight from the weight after the baby is fed to get an ‘approximate’ idea of how much was fed. I go by, 1 gram of weight = 1cc/ml of formula. Syringes are widely used for hand-feeding. A syringe is used to dispense the food directly into the chicks' mouth It also benefits from the chick's natural feeding response and teaches the baby to eat. The handfeeder can easily control the flow of the formula. 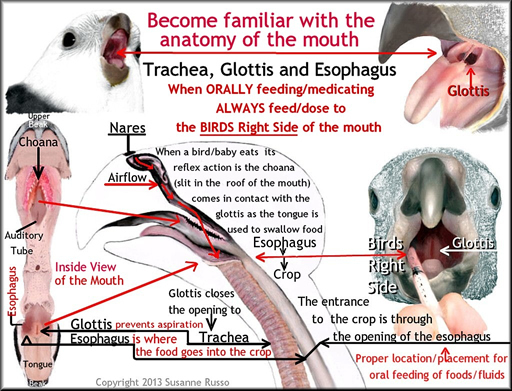 PRO: The syringe is inserted into the left side of the beak angled toward the esophagus (which is located on the right) and the formula is released slowly as the bird's head 'pumps' using the chick's natural feeding response. 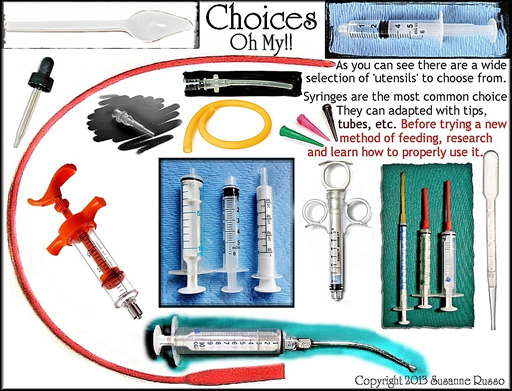 Even though a syringe is used, the principle is similar to tube feeding, and can be very risky if not properly done. 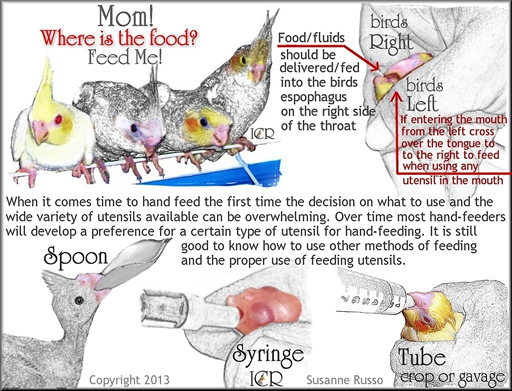 After a feeding response is elicited, the syringe is inserted into the bird's esophagus, and the formula quickly dispensed. The force of the formula being ejected from the syringe keeps the esophagus open and the trachea closed and the whole contents of the syringe can be delivered in seconds. It is similar to gavage feeding, because the food bypasses the mouth. Gavage feeding is the term for dispensing the formula into the crop using a feeding needle or a tube. In essence it is a means of force feeding a bird when there is resistance and no feeding response. Because of the possible dangers associated with this technique, this method of feeding is not recommended for an inexperienced feeder. 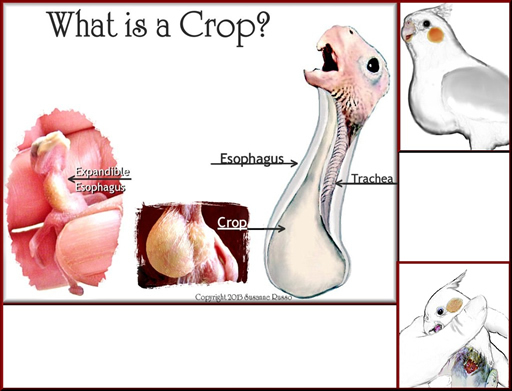 The feeding tube or needle is actually inserted into the mouth of the esophagus and down into the crop so that the formula can be released quickly. If the tube is pushed too far, or if the baby shifts or lunges, the tube may be pushed through the crop membrane and the outer skin to cause a puncture. Tube feeding may be necessary when birds are too sick to feed themselves, or with babies that don't have a natural feeding response. These are used for the dosing or feeding of small birds. In Summary… I have not noticed any behavioral differences associated with any one particular hand-feeding utensil or method. Tube/gavage babies are just as gentle and wean just as quickly as most other methods. It is the time spent socializing, handling, and meeting its emotional and psychological needs which makes the difference in their dispositions and adaptability to the non-feathered families. A feeding utensil is only a means to be used to get nutrition into a chick. No utensil or method is the absolute best. What suits one person or one species may not be the best for another. When hand-feeding, be flexible and open-minded, but do not change a successful feeding routine based on someone else’s opinions.